Fans of designer Gaby Basora's pretty Tucker line turned out early this morning to hit the designer's East Village sale. 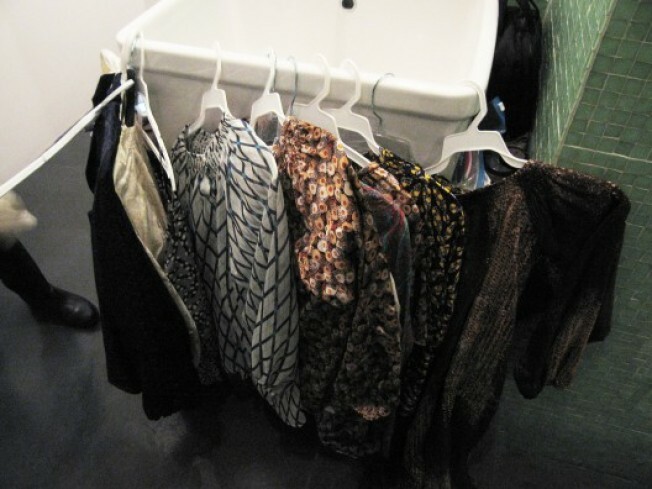 Held in a sizable apartment at at 79 2nd Street, it was fully stocked with blousy tops and dresses in a variety of colors, materials and prints. The tops, which retail from two to three hundred dollars online, were marked as low as $40, depending on style and season. The most expensive piece of clothing was an asymmetrical wool coat for $200; we spotted current-season cream jacquard smocked collar blouses for $130 (down from $264) and a silk butterfly-printed number from summer priced at $100. There were also a few dresses (which were going fast), blazers, coats, tees and jewelry. One really nice thing about this sale: you get to pick a little reusable tote made of the same fabric as the shirts to carry your purchase home in.